Although her content can vary from meditations on religious texts to vibrant abstracts from nature, Nancy DeClue’s work is consistently alive. The beauty of her painting is that while deeply influenced by the innate ebb and flow of nature’s energy, it seldom depicts the very landscape that inspired her. Rather, it is the fuel of conceptualism that drives her work, and the way it is translated onto the canvas often seems completely separate from the moment that inspired it. Like all true artists, DeClue cannot remember a time in her life she wasn’t creating. She began to pursue her work in earnest in 2002, when complications from a neck surgery forced her to slow down life’s obligations, allowing her art to flood in. In 2005, she was selected for an intensive period of study at the prestigious Santa Fe Art Institute. For two months, DeClue lived and worked in community with other artists in art-infused New Mexico, which helped her develop her own personal style. DeClue’s lack of formal art training has both its advantages and disadvantages. Though she admits she sometimes gets in over her head with a project, never having learned the limitations of certain media allows her to work purely from the visions that appear in her head. 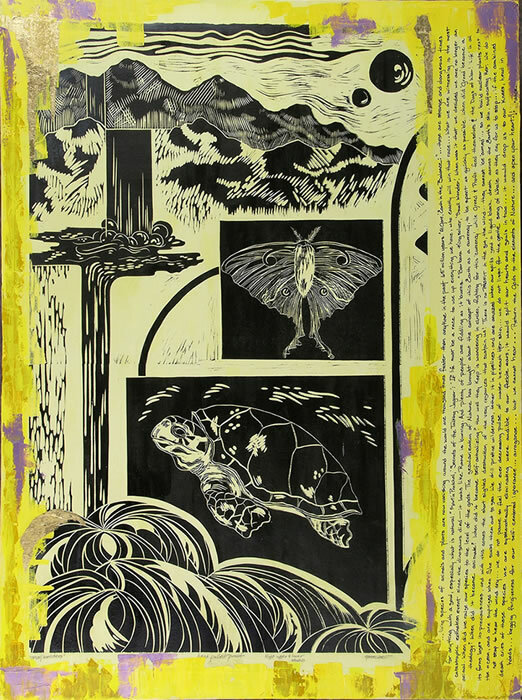 As with Small Wonders (upper right), the 2005 work to thank for her acceptance to the Santa Fe Art Institute, DeClue had never been warned a 48”x54” linoleum block print would be an ambitious project, and therefore didn’t think to shy away from it. Small Wonders, which is a cry for this culture to reverse its de-mystification of Nature, now hangs in DeClue’s downtown coffee haunt, Lakota. Rather than settling for representation, DeClue entreats viewers to enter her state of mind. In a recent multi-media collage series she has nicknamed The Word (bottom right), she writes or pastes text from altar prayers, a German Bible and other cultural religious influences, creating chaos from structural antiquity. 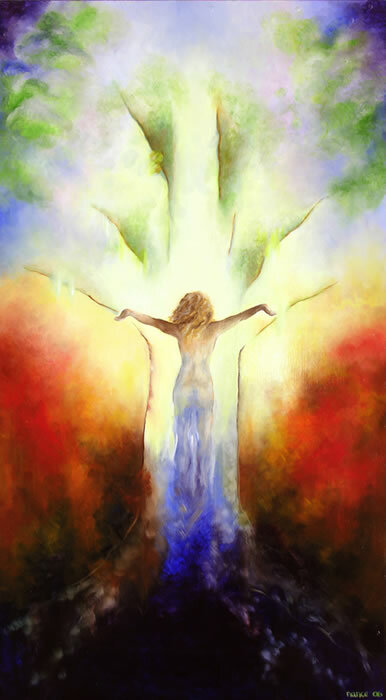 By forcing these concepts to collide, she disrupts the mutual exclusivity these old religions have claimed. ‘the image chooses the artist’, Evri Kwong to myself, 2005. The ‘image’ has always chosen me. It can be triggered by a dream, a concept, an event, a social reality, a tiny bloom, an insect with gossamer wings-something touches my soul. The ‘image’ or idea stays with me. It gestates. It then chooses a medium. It grows in intensity until I have to let it out. The resulting work or works often take on a life of their own. Almost self determined. This is how a series or large piece is conceived. This is my motivation-love colored with passion. My thirty plus years as a nurse, and especially my years in oncology, place these constructs within my unique life experience and philosophy. Deep respect and acute appreciation for all forms of life are interwoven with spirituality. Often a statement of society and its ‘norms’ or direction (especially when childishly self-serving) are veiled in my pieces. It is what drives my production. Sometimes-sheer breathtaking beauty is the muse. Sometimes-the attempt to grasp quantum mechanics. Perhaps-music, or the laugh of a child. ART IS THE REPRESENTATION OF PASSION.